This Bowl mats with raised edges protect the carpet against moisture and dirt. The pre-punched holes for the assembly points must be cut. Use the suitable hole punch Skandix 1067170. At the rear mats there are 2 different pre-punched holes. The position of the assembly points at the Floow can differ depending on the yearsmodel. 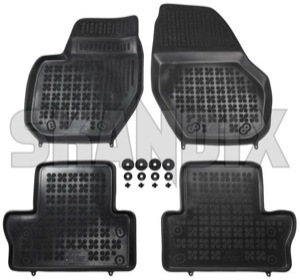 Due to this the rear mats have pre-punched holes in two different positions. By comparison, the genuine Volvo mats only have 2 holes which do not mach the assembly points at the XC60 2017. At this point the Skandix 1059714 set offers a preferred solution. The black rubber mats are matching all interior colors.